St Cyprian’s Church, Glentworth Street, London, Saturday 18th May 2002. Hitler’s army first invaded Russia on 22 June 1941. By September 1941 the Siege of Leningrad had begun, with the city’s population of 3 million encircled and cut off from the rest of Russia. According to official figures approximately 623,000 people died of starvation alone during the 18-month siege, although the unofficial estimate is closer to 1 million – a third of the population. Yet despite the horrendous conditions and constant attacks, and the evacuation of most of the orchestras and theatre companies, theatres still ran shows, musicians still played, and composers still composed. The composer spent the next few weeks digging ditches before being assigned to the fire brigade, where he was placed on the roof of the Leningrad Conservatoire to protect the building against incendiaries. Pictures of Shostakovich, the Leningrad fireman, were widely disseminated as a symbol of the heroic resistance of the people of Leningrad. Indeed, one such photograph found its way onto the front cover of the 20 July 1942 issue of Time magazine. Despite his eagerness to help out on the ground, Shostakovich’s true wartime vocation was with music – writing and arranging patriotic songs and arias – and on 19 July 1941 he began work on his Seventh Symphony. Although Shostakovich’s opening sentence is not strictly true, there is no doubting his love of, and commitment to, his native city. Of all the Leningrad artists, musicians and intelligentsia Shostakovich was one of the last, and most reluctant, to be evacuated. Indeed, the first three movements of the symphony were written in Leningrad, the massive opening movement having been completed by 29 August. Perhaps the defining movement of the entire symphony, the development section of this sonata form first movement is replaced by the notorious ‘invasion theme’. It was this 18 bar theme, with its twelve accumulating repetitions that most caught the imagination of the first listeners. Although Shostakovich was keen to downplay any overtly programmatic readings of the symphony, the general impression was that this section depicted the Nazi invasion of Russia and Leningrad. In his programme note for the first performance Shostakovich described this section not as battle music but `a requiem for the heroes who died for us’. Flora Litvinova (a biologist who met Shostakovich as a fellow evacuee in Kuybishev) describes how the composer told her, in confidence, that the ‘invasion theme’ depicted not only Fascism but any system of totalitarian rule, including Stalin’s regime. The theme itself makes a musical reference to an aria in Lehár’s opera The Merry Widow and it was this part of the theme that found its way into the fourth movement of Bartók’s Concerto for Orchestra. At least two published interpretations exist to account for Bartók’s reference to Shostakovich’s symphony, both of which are attributed to the composer. Antal Dorati claims that Bartók was consciously caricaturing Shostakovich’s symphony because, in Bartók’s opinion, the work was enjoying popularity in America beyond its merit. Whereas György Sándor claimed that neither Shostakovich’s or Lehár’s music was under ridicule, but rather Bartók was communicating an awareness of the impotence of the artist under totalitarian rule. Either way, the fact that Bartók should engage with Shostakovich’s symphony at all is a measure of the global popularity of the work during the war. The rhetoric of this statement suggests that Shostakovich was speaking not only to the people of Leningrad but perhaps also, and defiantly, to members of the German Army camped outside Leningrad. The third movement was completed on 29 September and two days later the composer and his family flew to Moscow as evacuees. Necessarily travelling light, Shostakovich took only the scores of his Seventh Symphony, his opera Lady Macbeth, and Stravinsky’s Symphony of Psalms. From there, on 15 October, the Shostakovich family was ordered onto a train to Kuybishev (now Samara) near Kazakhstan. Despite being given the best accommodation possible, and the use of an upright piano, Shostakovich found his living conditions very difficult to compose in. This movement, in which the composer wanted `to describe a beautiful future time when the enemy will have been defeated’ (Shostakovich), was finally completed on 27 December 1941. Ideally, Shostakovich would have liked Yevgeny Mravinsky and the Leningrad Philharmonic to have given the world premiere of his Seventh Symphony, but as they had been evacuated to Novosibirsk this was impossible. Instead the premiere took place on 5 March 1942 in the Kuybishev House of Culture, with the Bolshoi Theatre Orchestra conducted by Samuil Samosud. This performance was broadcast nation-wide and transmitted abroad to great acclaim. The Moscow premiere took place on 29 March, and on 11 April it was announced that Shostakovich had received a Stalin Prize (category 1). Microfilm copies of the score and parts were dispatched to the West as conductors such as Leopold Stokowski, Serge Koussevitzky and Artur Rodzinski vied for the right to give the US and Western premiere. In the event the Western broadcast premiere was given by Henry Wood and the London Philharmonic Orchestra on 22 June 1942, followed by the concert premiere on 29 June at a Proms concert in the Royal Albert Hall. 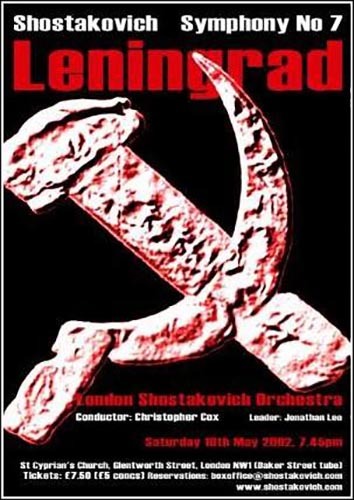 Yet, perhaps the most remarkable wartime performance was the Leningrad premiere on 9 August. Still under siege, and with most of the orchestral players evacuated or fighting on the front line, the one remaining orchestra in Leningrad (the Radio Orchestra) numbered approximately forty to fifty. Special rations were awarded to members of the orchestra to sustain them through the rehearsals and the concert, and the extra players needed to perform Shostakovich’s symphony were brought back from the front line. By the end of July the orchestra was in rehearsal, conducted by Karl Eliasberg (a fellow student of Shostakovich at the Petrograd Conservatoire). Immediately preceding the performance the commander of the Leningrad front, General Govorov, had ordered an attack on all enemy gun positions in order that the performance would not be interrupted. The Philharmonic Hall was packed for the concert and the performance was broadcast on loudspeakers throughout Leningrad. In addition, and as another show of defiance, there were loudspeakers relaying the concert to the German troops stationed outside the city. Throughout the remaining years of the war Shostakovich’s Seventh Symphony enjoyed huge success, with 62 performances during the 1942-’43 season in the US alone. Yet once the war was over the symphony came under attack from music critics in Russia and abroad, and it almost entirely vanished from concert programmes. Today, and partly as a result of the revelations in Testimony (the disputed memoirs of the composer), the symphony has regained some of its popularity, disproving Ernest Newman’s facetious prediction that `the position of the symphony in the musical map of the future will be located between so many degrees longitude and so many degrees platitude’.